Weaver was almost as good, allowing only one run in six innings, but Rodon and two relievers limited the Cardinals to just four hits. When Luke Weaver looked out at the starting pitcher for the White Sox on Wednesday night, he had a couple of flashbacks – to earlier games he had pitched against Carlos Rodon. When they were both in college, Weaver at Florida State and Rodon at North Carolina State, the two faced each other twice – once in 2013 and once in 2014, the year they both became first-round draft picks. Rodon won the first matchup before Weaver won on March 14, 2014. Rodon got his revenge on Wednesday night, throwing 7 1/3 scoreless innings to send the White Sox to the win in the game in Chicago. 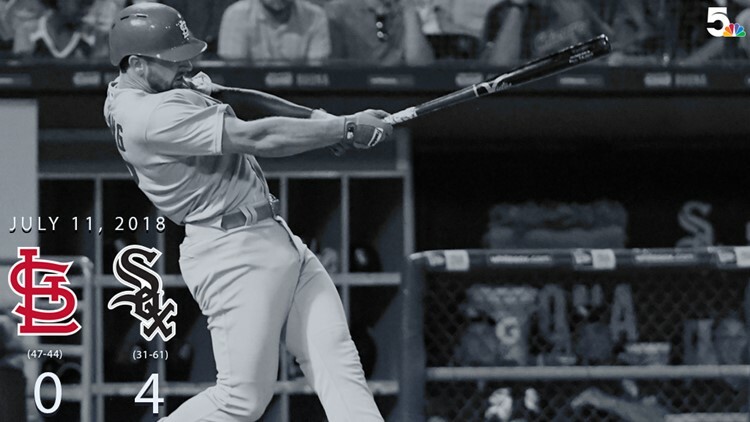 At the plate: The Cardinals’ best scoring chance came in the eighth inning, when they loaded the bases with one out but saw the threat die when Tommy Pham and Jose Martinez struck out. Pham struck out in all four of his at-bats … The only hits were a single by Martinez in the first inning, a one-out double by Matt Carpenter in the sixth and singles by Paul DeJong in the eighth and Yadier Molina in the ninth … Dexter Fowler hit eighth for the first time since 2012 and was 0-of-4. He has started at least one game in the top eight spots in the batting order this season. On the mound: Weaver allowed just three hits in his six innings but got in trouble with a leadoff walk in the fifth. A single on an 0-2 pitch sent the runner to third and he scored on a ground out. Weaver struck out seven but saw his record fall to 5-8 … Chicago added two runs in the seventh off Mike Mayers and one in the eighth against Jordan Hicks. Key stat: The Cardinals finished their longest road trip of the season with a 5-4 record. Despite the shutout, they averaged six runs a game on the trip and posted a .283 batting average (91-of-322). Worth noting: Miles Mikolas will start Sunday for the Cardinals, which will keep him from pitching in the All-Star game two days later. He will still attend the game and all the festivities … Tyler Lyons continued his rehab assignment at Springfield on Wednesday night, throwing a scoreless inning … Dakota Hudson got the start and the win in the Triple-A All-Star game, allowing one run on three ground ball singles. Daniel Poncedeleon struck out the side in his inning of work … Junior Fernandez, moved to the bullpen this year, was promoted from Palm Beach to Springfield on Wednesday … First baseman Luken Baker, the Cardinals’ third selection in this year’s draft, made his pro debut on Wednesday for the GCL Cardinals after recovering from a broken leg during his season at TCU. Looking ahead: The Cardinals will have Thursday off before beginning their final series before the All-Star break on Friday night against the Reds at Busch Stadium.